As a Degutabox affiliate, all ideas, recipes, & opinions are entirely my own. A Degustabox was provided to me for this recipe and review. It's the first day of fall, y'all! I couldn't be happier. Here in Texas, we're finally getting a 'cold front' in this week that will get us into the 70's at least. Phew. It's been a hot few weeks, so I'm ready for the cooler weather. I'm also loving that I'm starting to see winter vegetables coming in. I happened to get my hands on a local acorn squash and thought it would make a great addition to a fall style ratatouille; in place of eggplant since I am not a huge fan of eggplant unless it's entirely hidden in whatever it is I'm eating. Hey! No one ever said that ratatouille had to have eggplant in it, right? To start this ratatouille off, I got a mix of seasonal acorn squash, carrot, and some onion together. Then I added summer zucchini, red kidney beans, and a fresh tomato. For the sauce, I made it easy on myself and used a Haks Paks One Pot Cooking Sauce 'Rustic Ratatoullie'. It's all natural, gluten-free, and contains no preservatives. So it's nothing to be scared of. Plus, it's only got 25 calories in a serving. For the pasta I went with a corn and quinoa pasta from Sam Mills which was also mighty tasty. Both the Haks Packs and the Sam Mills pasta were in my latest Degustabox, so I figured this would be a brilliant way to merge the two together. To top everything off I gave it a good sprinkle of parmesan cheese and ta-da! 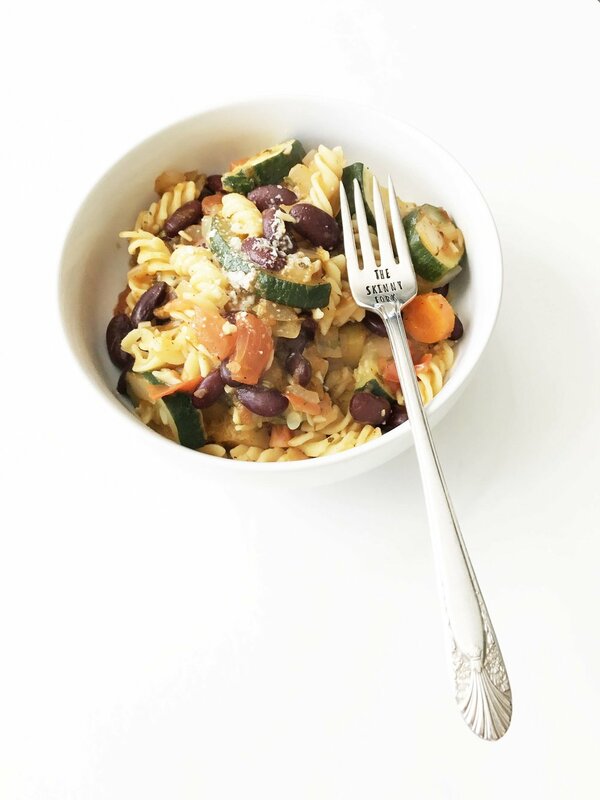 Easy peasy gluten-free one pot ratatouille! This is really a great weeknight dish that couldn't be much easier to toss together. Especially if you have random vegetables and cooked pasta leftover that need to be used up. Any of the vegetables here are easily swapped out for something else. So feel free to experiment. For me, I thought this dish was a perfect way to put summer to bed and wake fall up with a few vegetables from each season brought together into one cohesive bite. By the way, right now you can get 50% off your first Degustabox! Enjoy 10-15 FULL-SIZE tasty goodies delivered straight to your door for just $9.99! Shipping is free! Place the sliced carrot, onion, and acorn squash into the skillet and cook over a medium to medium-high heat until the vegetables are starting to soften, about 5 minutes. Add in the beans, zucchini and tomato and continue to cook until all vegetables are softened and cooked through, about another 5 minutes. Once the vegetables are done, add in the Rustic Ratatoullie Sauce and cooked pasta. Get everything nice and hot once again before removing from the heat.